Stateless Immigrant: National Gallery of Art Cell Phone Tour: If you can't beat them, join them! 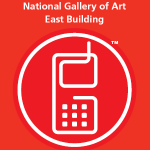 National Gallery of Art Cell Phone Tour: If you can't beat them, join them! If you're like me, you don't want your enjoyment of art to be interrupted by cell phones ringing or people yapping away on their phones. Now this is something remarkable though, and I really liked the way the National Gallery of Art in Washington has turned this potentially disturbing medium into a useful addition to their offerings. Instead of borrowing an audio-tour piece from the front desk, you can dial a local phone number and punch in the number of the exhibit to learn about it. Only a small selection of works has this option at this time, but nevertheless, I find this innovation really worth mentioning.